One of the most beloved stories told during Tu B’Shevat is that of Honi The Circle Maker Babylonian Talmud, Ta’anit, 23a. Honi was a great teacher who lived in Ancient Israel. He was known for drawing a circle on the ground and then praying inside it. He would not leave the circle until he was done. The rest of the story and two carob recipes after the jump. Honi smiled and continued on his way to teach at his Beit Midrash. Honi was very tired. He decided to rest for a while. Honi made himself comfortable on some grass, and watched the old man finish planting the carob tree. Honi closed his eyes and slept. He slept for seventy years! When he woke up, he saw a boy picking ripe carob pods from a large tree. “My great-grandfather,” replied the boy. Honi understood what the old man was doing all those years ago. Each generation needs to take care of nature and leave a legacy of trees for those to come. Tasting treats made with carob during the Tu B’Shevat Seder is just as much fun as recounting this story. I like to use carob “honey.” This is the thick syrup that forms inside the carob pod when it is ripe. You may purchase carob syrup here. 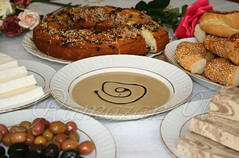 This is a very ancient Middle Eastern recipe, the Biblical peanut butter and jelly. Mix one tablespoon of tahini with one tablespoon of carob syrup. 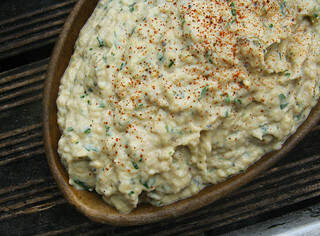 Spread over fresh, hot pita bread. One of the most exotic eggplant dishes I have ever tried is a meze traditionally served in Turkey, Syria, and Jordan. It is made with grilled eggplant, almonds, and carob honey. Roast the eggplants until they become soft. Allow the eggplants to cool to room temperature. Cut the eggplants in half, and scoop out the flesh. Serve with fresh, hot pita bread.